Listen to legally acquired Copyright content to kill Piracy! 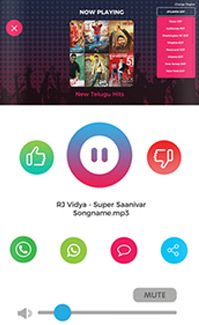 Content is also acquired by Partnerships with content providers and your Telugu Associations. Listen to content that is prepared and meant for you. 26 locations for now. More coming soon. Designed unique entertainment programming Content for our Listeners living abroad. Interactive Programs with Celebrities, Politicians, Doctors, Scientists, Attorneys, CPAs, Associations, Institutions etc. for Infotainment 24X7. Select the sections/editions from Newspapers you are interested...will read updates from last 24 hours for you. 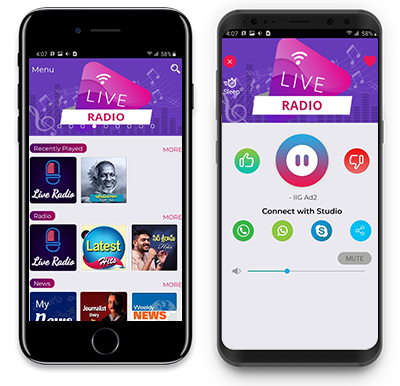 Live Entertainment: Radio Jockeys (RJ) driven Live Radio with Audience-Interactive Entertainment programs and Musicon various aspects, Celebrities, Doctors, Accountants and whoever makes a difference in our lives. My Radio: Unique Concept. You can select the sections/editions from Newspapers you are interested and will be able to listen to the news summary from last 24 hours. Set your preference once and just Hit “Play” from next time to listen to someone read it for you. Entertainment & Music: Along with Entertainment, Targeted for Listeners who are interested in Hit music until Year 2000. Millennium Hits: Along with Entertainment, Targeted for Listeners who are interested in Hit music in new Millennium. Devotional: Dedicated 3 hours of Devotional content round the clock. Content created specifically for that Day!